As a student looking to switch schools or colleges, or a recent graduate, you probably will require your transcripts. In order for you to be able to extract your transcripts from the respective educational institution, you will require a transcript request form or will need to submit a letter. To make it simple for you, we have a wide range of ready to use transcript request forms. These Request Forms are easy to download, can be edited and are available in multiple formats. 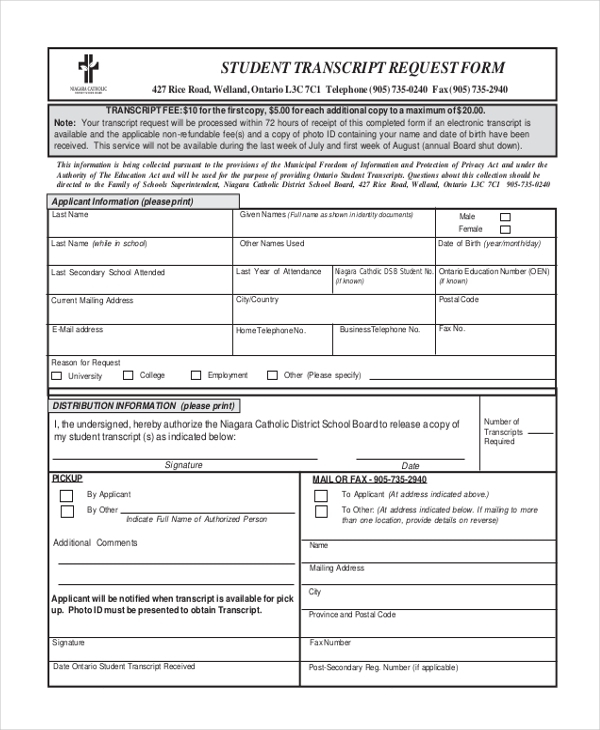 The college transcript request form is available in PDF format. 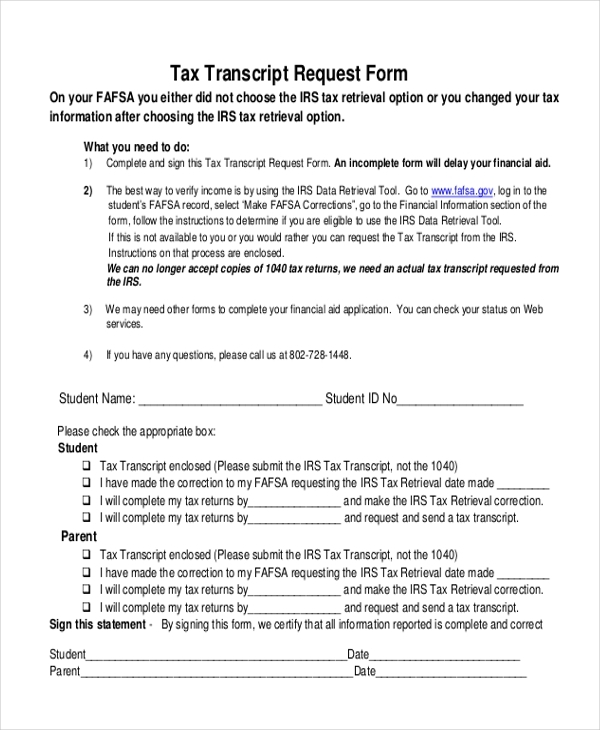 Details of the student name, the address where the transcripts need to be sent and other information can be added to this request form. 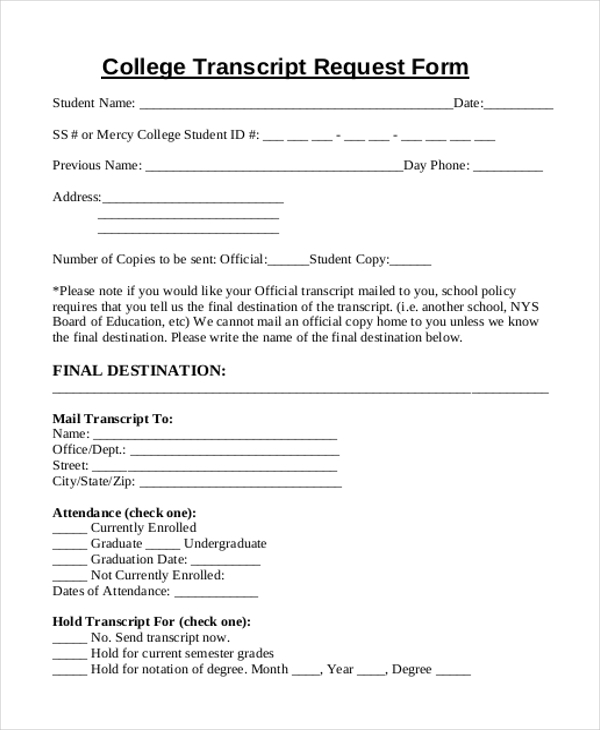 High school students who are looking to extract their transcripts from their school will find this form extremely useful. The request form comes in a PDF format. Name of the student, last year of attendance and other details can be added to this form. You may also see Transcript Request Forms. The tax transcript request form is available in PDF format. 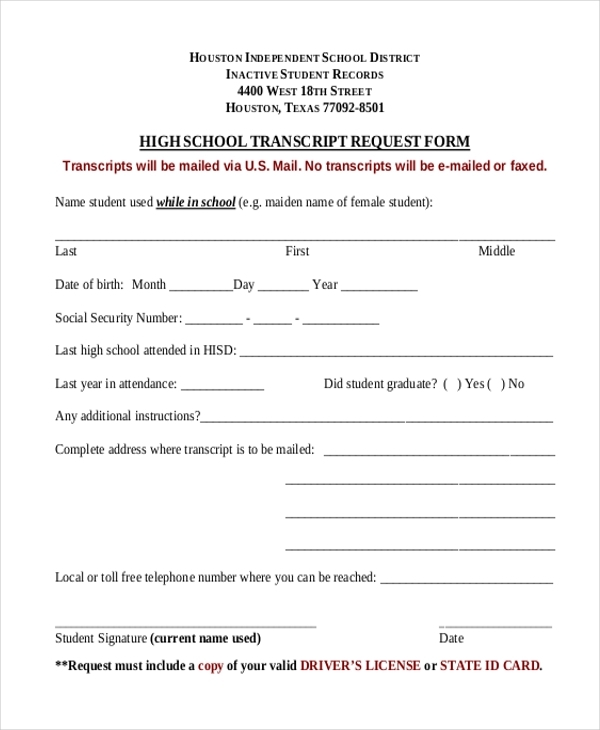 Details of the student name, student ID number, signature of the parent and other information can be added to this form. 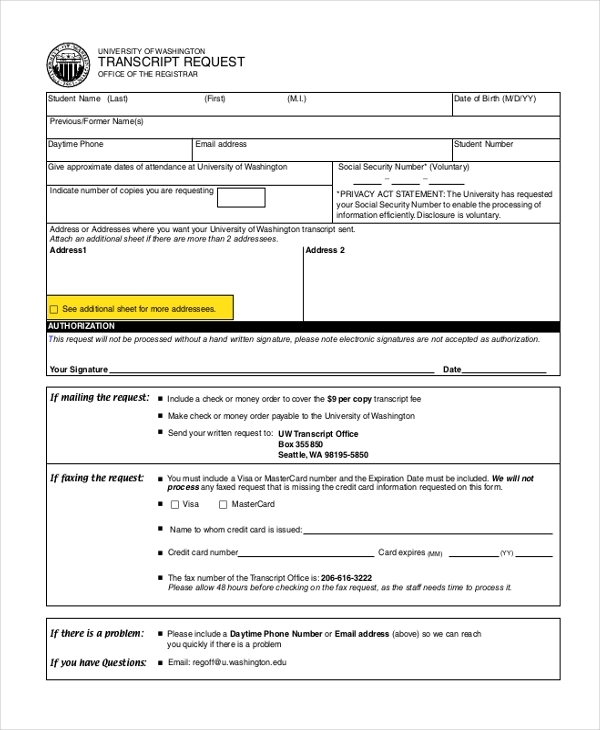 The tax transcript request instructions are also included in this form. The student transcript request form has space for the user to fill in all the details of the applicant. This form is available in PDF format and can be used by both schools as well as colleges. You can also see Event Request Forms. 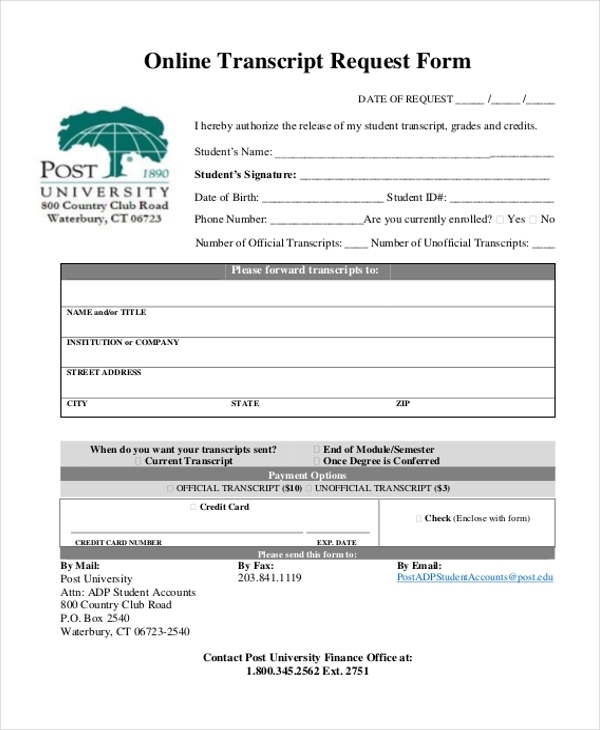 The generic transcript request form can be kept handy for students who are studying in universities. This form is available in PDF format. Details of the applicant and other information can be added to this form. The official transcript request form comes in a PDF format. Details of the applicant, student identification number, number of official copies of the transcript required by the student and other information can be added to this form. The online transcript request form can be uploaded and submitted online or even emailed. This form is ideal for students studying in universities. The form is available in PDF format. 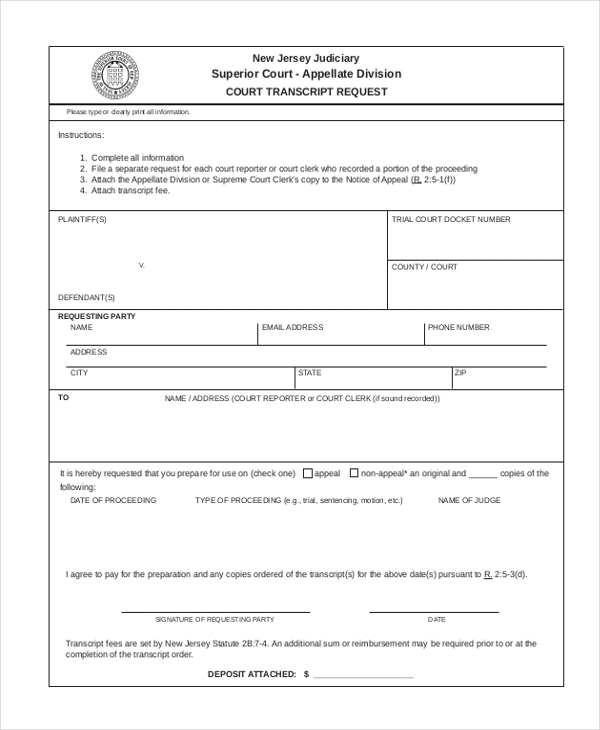 The court transcript request is a PDF format form that can be emailed or even printed out. Details of the deposit attached for the printing of the court transcript can be added to this form. You may also see Vacation Request Forms. The transcript release request form is perfect for college students who are looking to extract their transcripts. This form is available in PDF format. 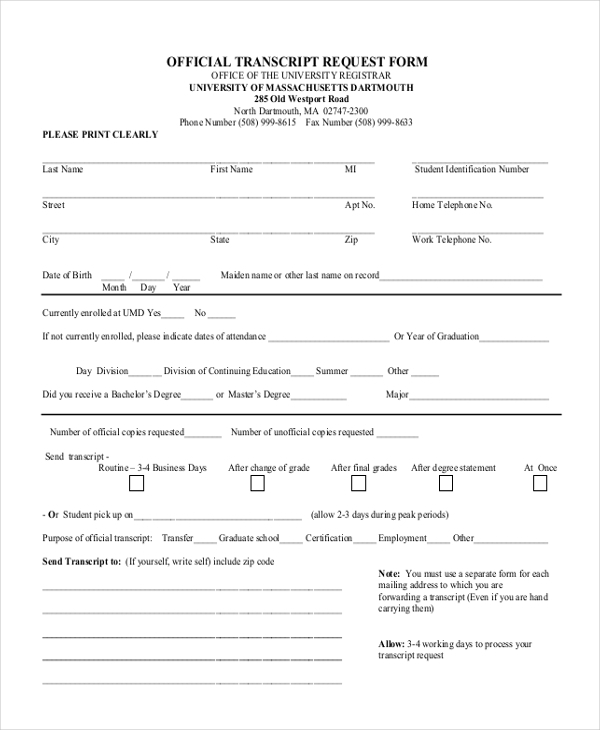 Details of the applicant, address of where the transcripts have to be sent and other information can be added to this form. Who are the Target Audience for the Transcript Request Forms? The transcript request forms are ideal for students as well as colleges, schools, universities and other kinds of educational institutions. Students who need a copy of their grades and details of their performance in school or college for submission to another school or their offices will find the transcript request forms extremely handy and useful. Further, universities and other educational institutions that need details of the applicant who is requesting for the transcripts, can keep these forms handy in the university office so that the applicant can instantly provide his or her necessary information. You may also see Leave Request Forms. What are the benefits of the Transcript Request Forms? The transcript request forms are beneficial for various reasons. First and foremost, these forms are absolutely free of cost and can be easily downloaded and saved. The user can edit and re-use the forms countless times as per his or her requirement. The universally usable formats that these request forms are available also make them extremely beneficial and handy. Another reason that the request forms are beneficial is because of their ready to use the feature. The user can directly fill in his or her details into the form without missing out on sharing vital and important information. So, if you’re looking to extract your transcripts from your school or university, these transcript request forms are just what you need. Just select one from the above-mentioned list that best fits your requirement, download it, edit it, print it out or email it and your work is as good as done. You can also see Time Off Request Forms.